This last weekend the family went on our first ever road trip together. 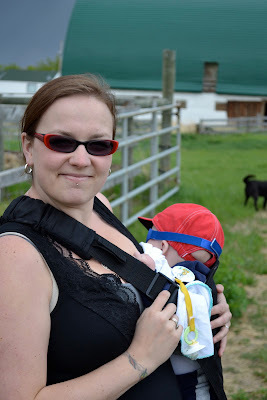 It's been tricky - we've been trying to get out to our friends' farm since before Artoo was born, but then a series of events - like Artoo coming early and his two trips to the hospital afterward kept preventing us from actually making it out there. It felt like if we made plans to go - Artoo would inevitably get sick. The only way to do it was to do it somewhat spur of the moment. And so - things looked good by the end of the week in our house, so Saturday morning we packed up the car with more things than you'd imagine a family of four people would ever need and drove 2 hours and got there just in time for lunch. what is it about boys that they feel the need to destroy things? sigh. i'll never know. Anyway, Chewie had a ball at the farm. Generally behind the camera, there are few pictures of me during family outings... Thanks B-rad for snapping this one of me and Artoo. SO that's what's going on here on the Diva Homefront. In my tile, you can see that my string really was just that, stripes. They do sort of radiate outwards from the top though. Thanks, as always, for taking these Zentangle journeys with me, and for your patience when i'm behind on my end - getting the slideshows up. I am so happy you were able to get away to the farm. Sounds like a great place! I hope Artoo will not be ill for long and that you have a great week. Thank you for the challenges. They always give me the stretching exercise I need in what would otherwise be hard to conceive ideas! How wonderful that you and your beautiful family were able to get out and enjoy the world! Another interesting challenge, I'm much more of a curve string girl so this felt a little awkward. Like your version and the dynamic slant. Glad you were able to get away, hope Artoo is doing well. I hope Artoo is feeling better. After raising three boys, I know even though they are exhausting at times, they are the joy in your world. I'm glad you get the chance to enjoy them. The pictures are great! Looks like you all had a wonderful time. I have two (grown) boys that are two years apart, and it was fun to take them somewhere they could just let all their boyness run free. Looks like you had a wonderful day at the farm! Hope Artoo is feeling better soon! Another fun Challenge!!! Thanks, diva!!! Loved the pics of your boys and you...I had two girls but now have a grandson...and wow! Are they ever different for the get-go!!!! Lots of fun, this one.. I may have to do a few more for myself. Your little ones are adorable. had to laugh about Chewie and the broken windows....boys eh? I hope Artoo is feeling better....thanks for the challenges and for all you do. I loved this challenge. I tried to keep it as straight and simple as possible. I enjoyed this challenge and the story of your trip to the farm. Fun, fun, fun! I'm busy with a zentangle in a similar format...so I had a good giggle when you posted this challenge! Great trip to the farm.. glad everyone had such a great time... here's my challenge for this week.. sorta stripey...lol..have so missed tangling...thanks..
My stripes got a little lost but I found this challenge much more relaxing than some. Thanks for your efforts. Hollybough for my stripes, 'cause I learned that pattern this week. I sure hope I am in the same time zone as Laura, because it is 11:56 p.m., EST and I am just getting in under the wire again! It's really been a fun week with this simple challenge that brought out a lot of emotion and happiness for me -- who'd a thunk it! I am so glad that Artoo is better. Sending prayers up north for continued improvement for "our" little guy!